While surfing on the net we came across the web pages, What is Homoeopathy and How Does It Work? presented by Emma sheppard, Oakham School, Rutland, UK. This extended Essay (EE) for the IB Diploma, is based on research and experiment. The paper has probed all aspects done so far and possibilities to prove homoeopathic medicines has imprint and is scientific. Here we place some exerpts from his paper. In the course of this essay I have attempted to answer the questions “What is homoeopathy” and “How does homoeopathy work”, concentrating more on how homoeopathy works than its system of philosophies. Homoeopathy believes in a dynamic vital force unique to all organisms that controls that organism’s state of health – each vital force vibrates at its own level for an optimum state of health. Any infection or toxin has its own vibration, and during interaction with the body’s vital force it creates resonance, resulting in disease of the body. Stress and the environment affect susceptibility of the vital force to disease. Homoeopaths believe that “like cures like”, and so a dynamic remedy is required, made from only one extract of plant, animal or mineral origin, although compounds can be made; only one remedy is administered once. Comparisons of homoeopathic and allopathic drugs for travel sickness and heart failure have been made. That water stores energy from the source extract transferred by succussion in the vibratory level. The higher the dilution is, the more vibratory energy the water molecules have, and so the more effective they are. Greater vibratory energies are shown in ice crystals made from homoeopathic water. That the elimination of the source drug during dilution up to the Avogadro Limit causes the formation of white holes and remnant waves, inducing hyperprotons; past the Avogadro Limit the hyperprotons are energies by succussion, and induce a structural change in the water. Organisms have remnant waves that are altered by illness and homoeopathic remedies. Homoeopathy, since its birth with Samuel Hahnemann over 200 years ago has become an alternative to traditional Western medicine, and many people put their faith in its methods and philosophies. Homoeopathy has been extended to veterinary medicine, where I first encountered it; my curiosity about it sparked the topic of this essay. Homoeopathy is, however, not wholly understood. It appears to work, but few scientists accept it. There is no clear-cut answer to the question of how homoeopathy works, and in trying to answer that question scientists have been ruined. I will not be attempting to find a definitive answer, but what I will do is lay out the most accepted theories and give my response to them. The vital force of an organism, which is the basis for J. T. Kent’s lectures on homoeopathic philosophy (as cited in Natural Veterinary Healthcare), has a formative intelligence that controls the organism, adapting to the changes it is subjected to. The vital force maintains the balance of the organism, and so to encourage the vital force is to encourage health; it reacts to all harmful stimuli. The harmful stimulus, be it bacteria, a virus or toxins, causes a reaction in the vital force that depends on the heath of the organism at the time, as well as the strength of the harmful stimulus. However, each organism has its own state of health - the organism’s vital force has its own optimum state of vibration, or ease. As the harmful stimulus produces a change in the vibration of the vital force, a similar vibration creates resonance within the vital force that moves the organism into a state of disease, away from its optimal state. Resonance, according to Vithoulkas (Natural Veterinary Healthcare, 1999), is excited by weakness and lowered vitality; the infection may be continually present in the environment, but once vitality falls – through stress, for example – the harmful stimulus can influence the vital force. The harmful stimulus can, therefore, cause a different reaction in three different individuals, depending on their own individual states of ease and predisposition. For example, the same flu virus infects two people; one appears to have a cold, the second spends a week in bed; each individual’s vital force resonates to the same stimulus differently. Dr. Samuel Hahnemann (1755-1843), in his criticism of modern medicine, turned to homoeopathy. He researched, and concluded ‘that the effect a substance has on the healthy organism indicated its curative powers for similar disease symptoms’; in effect, the same substance that induces a fever in a healthy man cures the fever in an ill man. Hahnemann – and Paracelsus – gave the guiding principle of homoeopathy, that same must be treated by same, or similia similibus curentur. To a biologist, the theoretical presence of a vital force can be attributed to self-awareness and response to illness. An infection produces damage and symptoms because the body is using resources normally “used” by other organs, eliciting a response in the form of a symptom. This flow of resources in fighting disease could be explained in the vital force, however no symptoms does not necessarily mean that there is no disease present, but that the body has the resources to cope with the infection. If the infection – the stimulus discussed earlier- is strong enough, or alien enough, to demand more resources to fight it, then symptoms are produced. Although the concept of formative intelligence is a little incredible, the concept of a vital force is possible – and it is a useful euphemism for the ebb and flow of resources within the body. Unlike allopathic medicines, there is no proven mechanism by which homoeopathy works. Allopathic drugs work by the interaction of the drug with systems in the body, but that cannot be the case in homoeopathy. Many of the sources or extracts used in homoeopathy are toxic to the body, and in order to eliminate the toxic effects the extract is diluted. 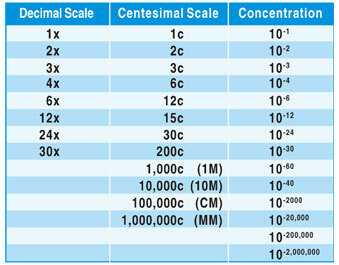 Homoeopathic dilutions are labeled with the units C and x (or D). Adding 1 part of the extract to 9 parts water or alcohol makes a 1x solution; a 1C solution is made by adding 1 part of the extract with 99 parts of alcohol or water, and then shaken vigorously, a process called succussion. At about 12C, the drug reaches the Avogadro Limit, where it is highly unlikely that any of the active ingredient remains in the solvent, and as a result many scientists and doctors refuse to accept that homoeopathy works. One possible explanation for the action of homoeopathic remedies on the health of a person has been that the drugs work by a medical phenomenon known as the Placebo Effect. The Placebo Effect occurs when a patient experiences alleviation of their symptoms while taking a placebo – a sugar pill that they are informed is a drug to cure them. The patient’s stress is relieved, and so that is thought to lead to an alleviation of symptoms; the placebo is psychosomatic. However, homoeopathic remedies cannot be psychosomatic, because veterinary homoeopathy is a growing trend, and the animals treated have no prior expectation of cure when dosed with any drugs. In cases of horses suffering from Cushings (Horizon, 21 May 2003), a success rate of up to 80% has been found with homoeopathic remedies – but there is no expectation of cure in the horse’s mind. Dr. David Reilley, in 1986, investigated the action of homoeopathic remedies in a clinical trial, using a homoeopathic remedy against a placebo – an accepted method of testing for new drugs (Horizon, 21 May 2003). A homoeopathically prepared remedy for hayfever, containing pollen, was tested alongside patients given a placebo of sugar pills. It was found that those patients who had taken the active medicine – the homoeopathic remedy – had the greater reduction in symptoms, proving that homoeopathy is not a placebo – however this has still not been accepted by many medical minds. 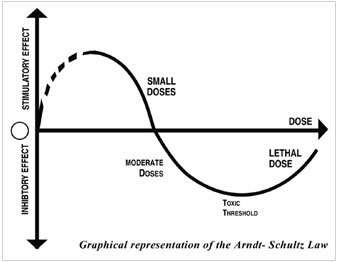 The Arndt-Schultz law is an early pharmacological law: ‘for every substance, small doses stimulate, moderate doses inhibit, large doses kill’ as shown in the diagram. The Arndt-Schultz Law states the homoeopathic principle of dilutions; homoeopathy operates in the area where stimulation occurs, whereas allopathy operates in the inhibitory area of dosages. 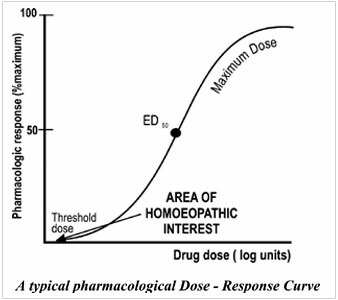 The allopathic recommendation of dosing lies at the point ED50, at approximately 50% of the maximum dose – while homoeopathy uses the threshold does at the beginning of the dosage scale. Homoeopathy, thanks to the work of Boyd in the early forties¹ works in accordance with the Arndt-Schultz law. Boyd found that while large doses of mercuric chloride inhibited the enzyme activity of malt distase, homoeopathically prepared 61x solutions of mercuric chloride actually accelerated the activity of malt distase – while the control of distilled water showed no inhibition or acceleration of enzymatic activity. The D8 effect is a phenomenon that occurs in homoeopathically prepared solutions of differing potencies. Studies conducted have shown that ‘the relation between amount of agent and effect is not linear’. The graph of effect against potency showed a maximum effect at the D8 potency; allopathy would predict that there would be the maximum effect at a much higher potency. One of the results of the D8 effect and Arndt-Schulz Law – and also the high dilutions – is that homoeopathic remedies are not dangerous to healthy people or animals. Because of this, homoeopathic remedies can be given to animals in their drinking water, and if any other animals were to drink the treated water, they would not be affected – and the same is true for human homoeopathic remedies. Hormesis is a relatively new subject – and many studies are incomplete – springing from the Arndt-Schultz Law, and studies began in the 1960s on the toxic effects of poisons at low dosages. Hormesis is in fact a phenomenon that demonstrates the now almost-forgotten Arndt-Schultz Law: that toxins have a stimulatory effect at low levels, and inhibitory effect at high doses. Hormesis has gone further than the Arndt-Schulz Law, in showing an unexplained homoeopathic phenomenon, that of rhythmicity. Rhythmicity shows that as dilution increases the reaction alters several times from stimulation to inhibition and vice versa. However, as the dilution becomes extreme, the reaction fades, unless it is succussed after every dilution. One possible theory for how homoeopathy works was the ‘memory of water’ put forward by Dr. Jacques Benveniste in June 1988, in the journal “Nature”. Benveniste, an expert in allergies, experimented with homoeopathically prepared solutions that should have induced a change in dyed basophils; although the solution did not contain any molecules – and was simply water – it had a positive effect on the basophils. However, once tested under investigation by Nature, it was found that the positive results were chance, not scientific evidence for water being able to remember the shape of the molecule of extract that it once contained. Since Dr. Benveniste – who still stands by his theory of the memory of water – investigations have continued and one possible way that homoeopathic dilutions work is to be found in the field of biophysics. Theoretical research has shown that the effect of homoeopathic remedies must come from the water that the solutions are made from, especially as there are no other molecules in the remedies except water molecules. All reactions, even biomolecular ones, require energy in order to occur, and that energy is contained within the reacting molecules. As a result, it is thought that homoeopathy works by the type of energy storage in the water molecules. In translation – the energy of moving the whole molecule from one place to another (also called kinetic energy). In rotation – the energy of spinning the whole molecule. In vibration – the energy of vibrating the molecular bonds. In electronic excitation – the energy associated with the electrons of the molecule. Translational energy storage is the lowest energy required, and is the energy that triggers the majority of all chemical reaction, and is altered simply by collision between molecules, even if they are the same. For this reason it is thought to be too low to make homoeopathy work. Electronic excitation, at the other end of the scale, is too high. In order to excite electrons, visible – or better still, ultra-violet – light is needed. Rotational energy is thought to be too low an energy. The frequency needed to rotate water molecules is 2.45x109 Hz, the frequency of a microwave – approximately 1.62x10-24 joules. 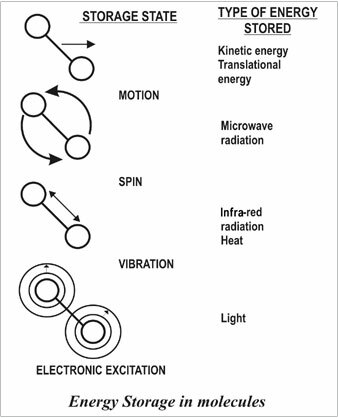 Vibrational energy, which lies between rotational and electronic energy, is an accepted means of storing energy in physics; it is also found in all three states of matter (gas, liquid and solid). It is now thought that succussion causes exchange of vibrational energy between the extract being diluted and the water. The water is left with a ‘vibratory impact’ that deepens with each further dilution as more and more succussion occurs. The “image” of vibrational energy left on the water molecules differs with each extract used, as each extract has its own differing levels of vibrational energy; if a molecule absorbs energy it changes its shape according to the energy it has absorbed. Homoeopathic remedies have been examined for structural changes (Callinan, P), which do appear. However, they only appear when the remedy has been prepared by succussion, and only when an extract has been used; a homoeopathic remedy can not be made from water alone. Ice crystal structures show the energy status of the water contained, and they effectively show the changes in structure in homoeopathic water, particularly where vibrational energy is concerned. As vibrational energy increases, the size of the ice crystals formed increases – and these largest crystals are to be found at the highest potencies, of dilutions, of homeopathic remedies3. 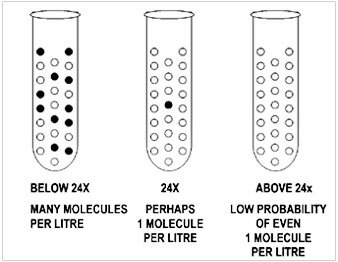 The Theory of High Dilutions is a theory based on a new mathematical model and the quantum theory that has been put forward as an explanation to how homoeopathic remedies work. It was developed by a physician, Roland Conte, a mathematician, Henri Berlocchi, and an allopathically trained doctor, Yves Lasne (who died in February 2001). They observed changes in the infra-red spectrum of homoeopathic solutions – which should have the same infra-red spectrum as water – and when analysed with Nuclear Magnetic Resonance (NMR) data, the Cotonian frequency was developed. The Cotonian frequency is unique to each remedy, and produces quantifiable results. The Cotonian model is based on several quantum theories and involves more higher mathematics than is sensible to try and explain here. The mathematical theory uses quantum mathematics, as well as Berliocchi’s semiotic mathematics, which he developed as part of his work on ethers. The theory is that the disappearance of the extract molecules during dilution creates white holes in the solution; white holes are the opposite of black holes - the other side, as it were, of a spiral black hole through space-time - and are thought to be a small but nevertheless highly-energised area of space-time. These white holes are singularities that induce a remnant wave proportional to the amount of particles lost. With the regular appearance of singularities created by successive dilutions, a regular sequence of remnant waves is created, increasing the amplitude of the remnant wave. After a certain time, the wave energy is released as infra-red radiation, and is easily measured. The white hole and remnant waves trigger nuclear reactions that emit beta energy - which is associated with electrons - and also change the NMR data and the IR radiation. However the nuclear reactions are known to have a low efficiency. After the Avogadro limit is reached, at about 12C, no more white holes can appear, as there are no molecules of the extract left to disappear. However, continued dilution and succussion stimulates hyperproton expansion. Hyperproton are free protonswith no mass or charge formed through the interaction of protons and white holes, which are thought to be able to pass in and out of space-time. Hyperprotons produce irradiation on matter surrounding them, and alter the structure of the water. The Theory of Universal Wave Function was developed in order to explain the effect of high dilution on organisms. Toxic substances trigger disease indicated by vector and phase displacement, and treatment with a remedy containing the counteracting phase displacement restores health. Organisms have a continuous process of elimination within their cells - from metabolic reactions, presumably - that can create white holes, and therefore remnant waves. Each organism can be considered to have their own remnant wave profile; illness disturbs this profile. Homoeopathy is a discipline in medicine that is gaining status, perhaps not with some of the staunchest scientists, but certainly with doctors, vets and their patients. Some of homoeopathy’s beliefs are a little incredible, hardly scientific explanations of what are undoubtedly scientific phenomena. However, it must be considered that, when some of those philosophies were formulated, the concept of a “vital force”, even to a scientist, was entirely possible. Homoeopathy is very different from allopathy, in both its belief system and its methods. However, there are a few similarities – both allopathic and homoeopathic drugs can be formed from plant or mineral extract, as the drugs used for heart failure show. Homoeopathic remedies, despite the obvious downsides that they take slightly longer to take effect, and that there is always the chance that, for that particular animal or person, they might not work (as is possible with allopathic medicines as well), have no side effects. Homoeopathic remedies, because they use only a small amount of plant extract and water as their basic ingredients, are also inexpensive to produce - and often cheaper than allopathic drugs. The theories as to how homoeopathy works are many and hugely different at times. They tend to use more and more biochemistry -and in the case of the High Dilution Theory, biophysics. The theory of Energy Storage to the Theory of High Dilutions; there seems to be more evidence for the former and you don’t need a PhD in quantum mathematics to really understand it. Both theories work on the basis that homoeopathy works, and certainly in the Theory of High Dilutions, that white holes can be formed in a certain way can produce certain effects. If in the future one of those assumed actions is proved to be wrong, then those theories will no longer be important. One thing has become apparent, and makes a link between homoeopathic philosophy and theoretical mechanisms: resonance. The concept expressed by Vithoulkas on resonance, is echoed in both the Energy Storage and High Dilutions theories. In the latter, the remnant wave profile of the body is disturbed by illness. In Energy Storage, the homoeopathic remedies have their own vibrational energy. This indicates that there might be a little truth in all of those theories and philosophies. We’ll just have to wait for the proof. Allott, A. (2001). Biology for the IB Diploma. UK: Oxford University Press. 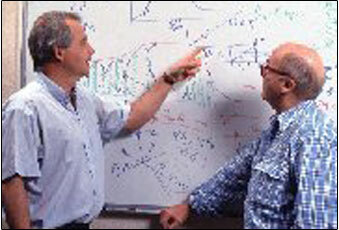 Burton, G., Holman, J., Lazonby, J., Pilling, G., Waddington, D. (2000). Salters Advanced Chemistry: Chemical Ideas (2nd Ed.). Oxford: Heinemann Educational Publishers Ltd.
Clegg, C.J. & Mackean, D.G. (2000). Advanced Biology: Principles and Applications (2nd ed.). London: John Murray (Publishers) Ltd.
4 Cohen, J., Pratchett, P. & Stewart, I. (2000) The Science of Discworld. Great Britain: Ebury Press. Complementary and Alternative Veterinary Medicine [Homepage for Alternative Veterinary Medicine]. (no date). Available: http://www.altvetmed.com (2003, May 30). Devenas, Benveniste et al (1988, June). Human Basophil Degranulation Triggered by Very Dilute Antiserum Against IgE. Nature 33. 816-830. Field Allen, T (no date). A Primer of Materia Medica for Practitioners of Homeopathy [online]. Available: www.homeoint.org/books5/allenprimer/ (2003, June 3). Ganong, W.F. (1981). Review of Medical Physiology (10th ed.). California: Lange Medical Publications. Guyton, A.C. (1982). Human Physiology and Mechanisms of Disease (3rd ed.). USA: W.B. Saunders Company. 2 Harisch, G., Kretschmer, M. & Riemann-Gürlich (1992, September). Der D8-Effekt: Eine Herausforderung für die Homöopathieforschung. Therapeutikon, 9. 386-392. Homeopathic Educational Services [Homepage of Homeopathic Educational Services]. (no date). Available: http://www.homeopathic.com (2003, June 4). Homéopathe International – English [English language Homepage of Homéopathe International]. (no date). Available: http://www.homeoint.org/english/index.htm (2003, June 1). Martin. E.A. (1998). Concise Medical Dictionary (5th ed.). Oxford: Oxford University Press. Natural Veterinary Healthcare – Welcome to the world of Eco-Vet [Homepage for Eco-Vet]. (no date). Available: http://www.ecovet.co.za (2003, May 29). Tennant, B. (1996). Small Animal Formulary (2nd ed.). Gloucestershire: British Small Animal Association. Théorie des Hautes Dilutions [Homepage of the Theory of High Dilutions]. (last updated May 2, 2002). Available: http://www.high-dilutions.net (2003, June 5). Walpole, B. (1986). Pocket Human Body. London: Kingfisher Books. Williams, N (2002). Horizon- Homeopathy: The Test. BBC (2003, May 21).